DKW (Dampf-Kraft-Wagen, English: steam-driven car) is a German car and motorcycle marque. The company and brand is one of the ancestor companies of the modern day Audi company as one of the four companies that formed Auto-Union. In 1916, Danish engineer Jørgen Skafte Rasmussen founded a factory in Zschopau, Saxony, Germany, to produce steam fittings. That year he attempted to produce a steam-driven car, called the DKW. Although unsuccessful, he made a two-stroke toy engine in 1919, called Des Knaben Wunsch – "the boy's wish". He put a slightly modified version of this engine into a motorcycle and called it Das Kleine Wunder – "the little wonder" the initials from this becoming the DKW brand: by the late 1920s, DKW was the world's largest motorcycle manufacturer. 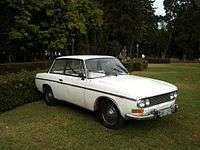 DKW-badged cars continued to be built under license in Brazil and Argentina until 1967 and 1969 respectively. 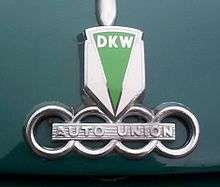 The DKW trademark is currently owned by Auto Union GmbH, a wholly owned subsidiary of Audi AG which also owns the rights to other historical trademarks and intellectual property of the Auto Union combine. More significant was a series of inexpensive cars built 300 km (185 miles) to the south in Zwickau in the plant acquired by the company's owner in 1928 when he had become the majority owner in Audi Werke AG. Models F1 to F8 (F for Front) were built between 1931 and 1942, with successor models reappearing after the end of the war in 1945. They were the first volume production cars in Europe with front wheel drive, and were powered by transversely mounted two-cylinder two-stroke engines. Displacement was 584 or 692 cc: claimed maximum power was initially 15 PS, and from 1931 a choice between 18 or 20 hp (15 kW). These models had a generator that doubled as a starter, mounted directly on the crankshaft, known as a Dynastart. DKWs from Zwickau notched up approximately 218,000 units between 1931 and 1942. Most cars were sold on the home market and over 85% of DKWs produced in the 1930s were the little F series cars: DKW reached second place in German sales by 1934 and stayed there, accounting for 189,369 of the cars sold between 1931 and 1938, more than 16% of the market. In 1939, DKW made a prototype with the first three-cylinder engine, with a displacement of 900 cc and producing 30 hp (22 kW). With a streamlined body, the car could run at 115 km/h (71 mph). It was put into production after World War II, first as an Industrieverband Fahrzeugbau (IFA) F9 (later Wartburg) in Zwickau, East Germany, and shortly afterwards in DKW-form from Düsseldorf as the 3=6 or F91. Their first car was the F89 using the body from the prototype F9 made before the war and the two-cylinder two-stroke engine from the last F8. Production went on until it was replaced by the successful three-cylinder engine that came with the F91. The F91 was in production 1953–1955, and was replaced by the larger F93 in 1956. The F91 and F93 had 900 cc three-cylinder two-stroke engines, the first ones delivering 34 hp (25 kW), the last 38 hp (28 kW). The ignition system comprised three independent sets of points and coils, one for each cylinder, with the points mounted in a cluster around a single lobed cam at the front end of the crankshaft. The cooling system was of the free convection type assisted by a fan driven from a pulley mounted at the front end of the crankshaft. The F93 was produced until 1959, and was replaced by the Auto-Union 1000. These models where produced with a 1,000 cc two-stroke engine, with a choice between 44 hp (33 kW) or 50 hp (37 kW) S versions until 1963. During this transition, production was moved from Düsseldorf to Ingolstadt, where Audi still has its production. From 1957, the cars could be fitted with a saxomat, an automatic clutch, the only small car then offering this feature. The last versions of the Auto-Union 1000S had disc brakes as option, an early development for this technology. A sporting 2+2 seater version was available as the Auto-Union 1000 SP from 1957 to 1964, the first years only as a coupé and from 1962 also as a convertible. In 1956, the very rare DKW Monza was put into small-scale production on a private initiative, with a sporting two-seater body of glassfiber on a standard F93 frame. It was first called Solitude, but got its final name from the long-distance speed records it made on the Autodromo Nazionale Monza in Italy in November 1956. Running in Fédération Internationale de l'Automobile (FIA) class G, it set records including 48 hours at an average speed of 140.961 km/h (87.589 mph), 10,000 km at 139.453 km/h (86.652 mph) and 72 hours at 139.459 km/h (86.656 mph). The car was first produced by de:Dannenhauer & Strauss in Stuttgart, then by Massholder in Heidelberg and lastly by Robert Schenk in Stuttgart. The number produced is said to be around 230 and production finished by the end of 1958. A more successful range of cars was sold from 1959, the Junior/F12 series based on a modern concept from the late 1950s. The range consist of Junior (basic model) made from 1959 to 1961, Junior de Luxe (a little enhanced) from 1961 to 1963, F11 (a little larger) and F12 (larger and bigger engine) from 1963 to 1965, and F12 Roadster from 1964 to 1965. The Junior/F12 series became quite popular, and many cars were produced. An assembly plant was licensed in Ireland between 1952 and c.1964 and roughly 4,000 vehicles were assembled, ranging from saloons, vans and motorbikes to commercial combine harvesters. This was the only DKW factory outside Germany in Europe. In 1960, DKW developed a V6 engine by combining two three-cylinder two-stroke engines, with a capacity of 1,000 cc. The capacity was increased and the final V6 in 1966 had a capacity of 1,300 cc, which developed 83 hp (62 kW) at 5,000 rpm using the standard configuration with two carburettors. A four-carburettor version produced 100 hp (75 kW), a six-carburettor one 130 hp (97 kW). It weighed only 84 kg (185 lb). 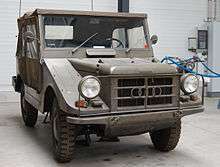 The V6 was planned to be used in the DKW Munga and the F102. About 100 engines were built for testing purposes and 13 DKW F102 and some Mungas were fitted with the V6 engine in the 1960s. 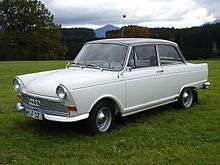 The last DKW was the F102, coming into production in 1964 as a replacement for the old-looking AU1000. However, the F102 sold poorly - largely due to its two-stroke engine technology which was at the limit of its development, resulting in Auto Union's parent - Daimler-Benz, to offload the company to Volkswagen. The car was re-engineered with a four-stroke engine and relaunched under the resurrected Audi brand as the F103. The transition to four-stroke engines marked the end of the DKW marque for cars, and the rebirth of the Audi name. 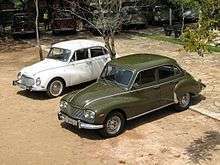 From 1956 to 1967, DKW cars were made in Brazil by the local company Vemag (Veículos e Máquinas Agrícolas S.A., "Vehicles and Agricultural Machinery Inc."). Vemag was assembling Scania-Vabis trucks, but Scania Vabis became an independent company in July 1960. The original plans were to build the Candango off-roader (Munga), a utility vehicle and a four-door sedan, called Vemaguet and Belcar respectively. 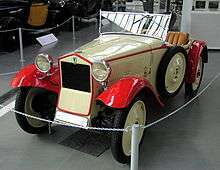 The first model built was the 900 cc F91 Universal but the Belcar and Vemaguet names were applied later. In 1958, the F94 four-door sedan and station wagon were launched, in the early 1960s renamed Belcar and Vemaguet. The company also produced a luxury coupe (the DKW Fissore) and the off-road Munga (locally called Candango). 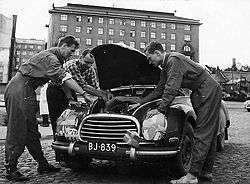 In 1960 Vemag cars received the larger one-litre, 50 PS (37 kW) engine from the Auto Union 1000. 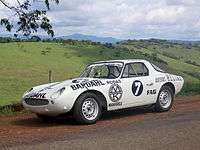 Vemag had a successful official racing team, with the coupe GT Malzoni, with fiberglass body. This project was the foundation of the long-lasting Brazilian sports car brand Puma. The Brazilian F94 line has been improved with several cosmetic changes and became more and more different from the German and Argentine models. Vemag had no capital to invest in new products and came under governmental pressure to merge. In 1964-1965 Volkswagen gradually took over Auto Union, a minority holder in Vemag, and in 1967 Volkswagen bought the remainder of the stock. VW quickly began phasing out DKW-Vemag production and introduced the Volkswagen 1600 sedan to the old Vemag plant, after a total of 109,343 DKW-Vemag cars had been built. The DKW Munga was built by Auto Union in Ingolstadt. Production began in October 1956 and ended in December 1968, with 46,750 cars built. 1 2 3 Odin, L.C. World in Motion 1939 - The whole of the year's automobile production. Belvedere Publishing, 2015. ASIN: B00ZLN91ZG. ↑ "DKW Specifications". Dyna.co.za. 2008-11-13. Retrieved 2010-10-02. ↑ "Vemag". Automobile Quarterly. Automobile Quarterly. 11 (4). 1973. the Vemag company that had been manufacturing two-stroke DKW models under license in Brazil. ↑ Shapiro, Helen (Winter 1991). "Determinants of Firm Entry into the Brazilian Automobile Manufacturing Industry, 1956-1968". The Business History Review. 65 (4, The Automobile Industry): 897. 1 2 Vogel, Jason; Gomes, Flavio. "DKWs in Brazil". KTUD Online Automotive Archive. Archived from the original on 2013-05-15. ↑ "Auto Union". Coche Argentino. 2009-05-18. Archived from the original on 2011-11-05. Retrieved 2011-10-30. 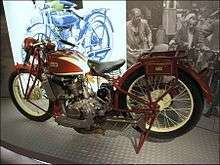 ↑ ISDT award winning DKW 246cc 1935. Siegfried Rauch Hrsg. von Frank Rönicke: DKW – Geschichte einer Weltmarke. Motorbuch-Verlag, Stuttgart 2007, ISBN 978-3-613-02815-9. Thomas Erdmann: Vom Dampfkraftwagen zur Meisterklasse – Die Geschichte der DKW Automobile 1907–1945. autovision, Hamburg 2003, ISBN 3-9805832-7-9. Peter Kurze: DKW Meisterklasse – Ein Wagen für die ganze Welt. Delius Klasing, Bielefeld 2005, ISBN 3-7688-1646-X. Wikimedia Commons has media related to DKW.